Wednesday Wrap – CES 2015 round-up special | What Hi-Fi? From Roku's plans to support 4K Ultra HD streaming on future Roku TV models to the launch of new Android-powered TVs from Philips, here's the news in brief from What Hi-Fi? 's Wednesday Wrap – CES 2015 special. After taking time to gather momentum, it seems that the 4K Ultra HD TV bandwagon is now picking up pace at a fair rate as more content becomes available and prices come down – a trend that has not gone unnoticed at Roku. The company has used CES 2015 in Las Vegas as the stage on which to announce - among other things - that it is going to support 4K content on future Roku TV models – with TV manufacturer TCL and Netflix signed up as Ultra HD partners. MixRadio has announced that it has launched as a "fully integrated streaming service" on Harman Kardon's Omni speakers, opening up access to 35 million tracks contained in MixRadio's library. Harman Kardon's Robb Mason said: "Adding MixRadio to the Harman Kardon Omni experience helps us to deliver on our promise of seamless and effortless music enjoyment in the home." 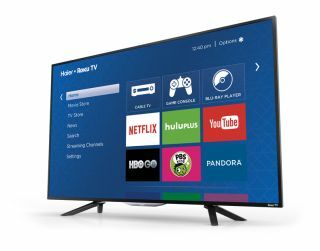 TP Vision has launched the second generation of Android-powered Philips TV at CES 2015, with "almost the entire 2015 range" of Philips-branded TVs to run on the Android TV smart platform. Philips TVs will offer direct access to the Google Play store, as well as on-demand and catch-up TV from the Philips Smart TV platform and online gaming services including OnLive. PS Audio has unveiled the final pre-production prototype of its Bascom H King Signature Amplifier, a stereo power amp featuring a triode front end and all-MOSFET circuitry – including the output stage. It's the first PS Audio product to come with vacuum tubes and is due to go into full production by May, before it is launched at the 2015 Munich High End Show. It's expected to cost $7499 when on sale. Keith Monks Audio unveiled the new discOvery mini One Sapphire Limited Edition Record Cleaning Machine at CES 2015, with the unit drawing on the features of the original discOvery One from 2013. The Sapphire is said to be the smallest Keith Monks product and comes with a vacuum gauge and a hinged lid cover, plus the Keith Monks Classic wash system built in. It's limited to 45 units worldwide.